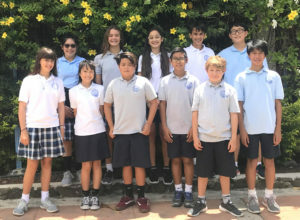 On Wednesday, August 15th, 2018, Mary, Star of the Sea School held their Student Council Elections. Prior to voting, students from grades 1 to 8 heard from all the candidates as to how each of them would serve the school. The candidates were articulate and confident and sometimes even showed their sense of humor. Students and faculty were then able to vote and the winners are pictured below. CONGRATULATIONS to our new 2018-2019 student council. We are confident they’ll serve our students and represent our school well.